When most people think of chiropractors, they think of back pain. While it’s true that a majority of the complaints we hear from our patients involve some form of back pain, we care for the entire body as a one, complex system. According to the 2010 Global Burden of Disease study, the leading cause of disability, across the globe, is lower-back pain. As much as 80% of all working Americans will suffer from some type of back pain during their lifetime. In the United States alone, we spend upwards of $50 Billion, every year, to relieve our back pain. The #2 cause for missed work in the U.S., is back pain. The only condition that keeps people out of work more often are upper respiratory infections–the common cold & sinusitis. Most cases of back pain aren’t caused by serious conditions such as inflammatory arthritis, cancer, or fractures. Most causes are mechanical in nature. So… What Causes Back Pain? Your back is a complex structure consisting of numerous bones, joints, ligaments and muscles. Frequently, ligaments and muscles are strained, discs rupture, and joints become inflamed. Any one of these conditions can lead to significant back pain. In many cases, automobile accidents, sports-related injuries, and workplace injuries can be the root cause for your back pain. However, sometimes the the most benign of activities can trigger pain—for example, picking up a pen dropped on the floor— can result in a surprising amount of pain. 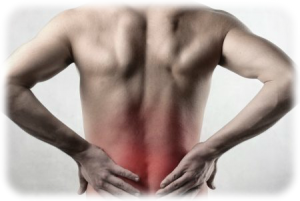 Other causes of back pain can be related to, simple arthritis, bad posture, obesity, or psychological stress. Lower- and upper-back pain can also be a symptom of a more serious, underlying issue such as kidney stones, kidney infection, blood clots, tumors, internal organ diseases, or bone loss. Over the past century, the manipulation techniques used by Doctors of Chiropractic (DCs) manipulation have largely been dismissed by the healthcare industry. As of late, this view has shifted dramatically as modern healthcare professionals are now beginning to see the value in chiropractic treatments. And with the recent emphasis on reducing overall healthcare costs, chiropractic is receiving even more widespread attention. Chiropractic spinal manipulation is a proven-safe, and effective pain relief treatment. It helps reduce back pain, decreases the need for medications, and rapidly advances physical therapy efforts. Dr. Davis has been using chiropractic techniques to help Gaithersburg and Rockville residents with their back pain for 30 years. The Journal of the American Medical Association recently published an article suggesting chiropractic care as a viable option for patients suffering from lower back pain. They also noted that surgery is typically not needed and it should only be tried if all other therapeutic alternatives fail. Remain active (always check with your doctor to ensure you’re healthy enough to exercise). Always maintain a healthy diet and weight. Avoid prolonged periods of inactivity or bed rest. Make sure you warm up or stretch before exercising or starting other physical activities (such as gardening). Wear comfortable shoes. Women–avoid those high heels as much as possible. Minimize the deleterious curving effects on your spine by sleeping on a mattress of medium firmness. When you must lift heavy objects, always lift with your knees. Never twist while lifting. QUIT SMOKING. It’s a fact that smoking impairs circulation and blood flow, slows the healing process, and deprives your spinal tissues of much needed nutrients. If you work a desk job, check with your chiropractor to ensure your workspace is ergonomically correct. Poor workplace posture can exacerbate your back problems. Make an appointment to consult with Dr. Davis about your back problems and get yourself back on the road to wellness and an improved quality of life!